It’s that time of year again! We are excited to announce that our next Patient Appreciation Night will be held on May 16, 2013! We will have a private screening of Iron Man 3 at Harkins-Chandler Fashion Square. 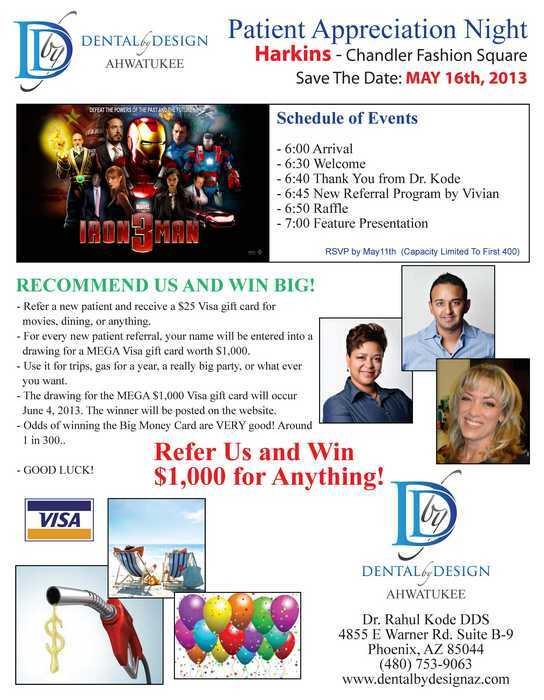 RSVP to this event at our office by May 11, 2013! For every new patient referral that you give us, your name will be entered into a drawing for a MEGA VISA Gift Card worth $1,000!! The winner will be drawn on June 4, 2014! We look forward to seeing you at our Patient Appreciation Night!